"Gold kanet is a flowering plant commonly found in the Ascadian Isles and on Azura's Coast." 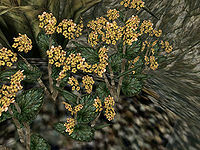 Gold Kanet is a flower commonly found in the Ascadian Isles and Sheogorad regions. Ajira at the Balmora Mages Guild will ask you for a sample when you do the Four Types of Flowers quest for her. 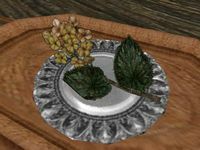 There is a special variety of Gold Kanet called "Roland's Tear" (ID:ingred_gold_kanet_unique), which is found near Ald Sotha. It is identical in both appearance and effect, but you'll need to find some for the quest of the same name for Aurane Frernis in Vivec. * Roland's Tear plants have a 100% chance to harvest. * Four of these plants are the Roland's Tear variety. One of them will have 3 samples, but the other three will only have 1 each. This page was last modified on 29 January 2019, at 07:21.